One of the hardest things about copywriting is the sheer amount of stuff you need to accomplish through your writing. You’re relying on your content for a lot of things! It’s not just about communicating an idea clearly and simply. Your content needs to connect with your audience, get them to trust you, and encourage them to buy. It needs to represent your own brand and business objectives in a clear and engaging way. ANNND it needs to actually, you know, be fun to read, with good spelling and grammar and all that. Fear not, my friend. You can do this, I promise. The question is, HOW? I mean, it’s hard enough to just sit down, organize your thoughts, and get them down on paper without also having to make sure your writing fulfils an entire list of requirements. So today I thought I would go through five questions that copywriters and communications professionals will always ask themselves when they’re creating content. Asking yourself these questions when you sit down to create your own content will make sure that your writing doesn’t just sound good, but that it’s actually helping you achieve your goals, strengthen your brand, and build your relationship with the audience you’re serving. Question 1: Is the content consistent with your overall brand and business objectives? The content you create should always be serving one of those reasons, either directly or indirectly moving you towards the goals you have for your business as a whole. However, that will look different for each business, depending on how you choose to construct their overall narrative and brand story. For example, you’ll see some creative businesses whose content is focused almost exclusively on the products and services that they offer — their brands are oriented towards professionalism and expertise. Others tell a much broader story, weaving in elements of their personal lives to create a connection with their customers built on shared values and experiences. Both of these approaches can be very successful — but the point is to be intentional about the choices you’re making within that overall strategy. This first question will help you make that intentional choice. It points you back to the high-level strategic stuff of how and why you run your business, and makes sure that your content is working to support those overall objectives. As a creative business, how do you relate with your customers? How do you build a relationship with them that creates trust and encourages them to think of you as the go-to person when it comes to your field? Once you know the answer to those questions, you can use your content to start building that relationship and conversation with current and prospective customers. Now you’re using your content strategically. Question 2: Are you clear on what you need this project or initiative to accomplish and what the outcomes should be? Does the content move you toward those goals? The last question was focused on a really high level look at your business; this question helps you narrow things down a little bit. Within your business, you’ll generally have multiple things going on at the same time — for example, maybe you’re balancing ongoing client work with developing or launching a new product. Within each of those projects or initiatives, you’ll need to create content: website copy, social media posts, blog posts, scripts for videos or lessons; the list goes on. The goal with this question is to focus in on what you’re trying to accomplish with this particular project or initiative, and make sure that the content that you’re creating supports that goal. If you’re working on a sales campaign for a new product, you’re going to make sure that all of your content is focused on that particular topic or customer need, encouraging them to trust you and buy from you. If instead you’re thinking about your client work and making sure that you’re serving existing and future customers, your content will be more focused on building the relationship, understanding your customers through surveys or questions on social media, and sharing what you’re doing to help them. Why am I creating this particular piece of content? What part of my business does it serve? What is the outcome that I want this piece of content to achieve? What do I want my audience to think or do after they’re read (or watched, or listened to) this piece of content? What can I do as I’m writing to move my audience towards that goal? Question 3: Does the content speak to the reader’s needs? Does it show that you understand what they need, and that you can help? While you may be creating content as a way of growing your business, that’s not why your audience is consuming it. Your audience is interested in what you have to say not because it helps you, but because it helps them. As a result, for your content to be effective — for it to be something that your audience loves and responds to — you need to make sure that it is fully focused on your reader and what they need. What is the pain point that they need to solve? What worries, fears or insecurities do they have in relation to the topic you’re addressing? What is holding them back from success? What would that success look like? Once you’ve got a sense of what your audience’s needs might be, you should craft your content in a way that responds to those needs. Acknowledge some of those fears or insecurities, and then tell them how you can help. Paint a picture of how their life will be better after reading / buying / acting on your content. If I was sitting down with this person over coffee, how would the conversation go? You’d probably chat about what they’re struggling with, and then offer some suggestions that are meant to help them out. Try to work some of that “conversation” into your content. Question 4: Is there a clear action item or next step that the reader should take? Once you’ve provided your reader with helpful content that will help solve their problem and make their life better, your next step is to call them to action. This is where you’re bringing together your focus on your audience with the business goals you’ve identified in the first two questions. Whatever CTA you choose, it should take advantage of the momentum you’ve built through your content — building a relationship with the reader, connecting with them and showing them that you have the authority and expertise to help — and turn the conversation over to them: If they want to keep going, here’s what they need to do. The purpose of the CTA is to get your customer to take a step that supports the original objectives you set out when you began creating your content. It needs to be very clear. Use strong, commanding language that inspires action — Click here; Buy Now; Book your appointment today — and make sure that it is clearly visible and hard to miss. What one thing do I want my customer to do in response to the content I’m creating? How can I make it as easy as possible for them to take action? 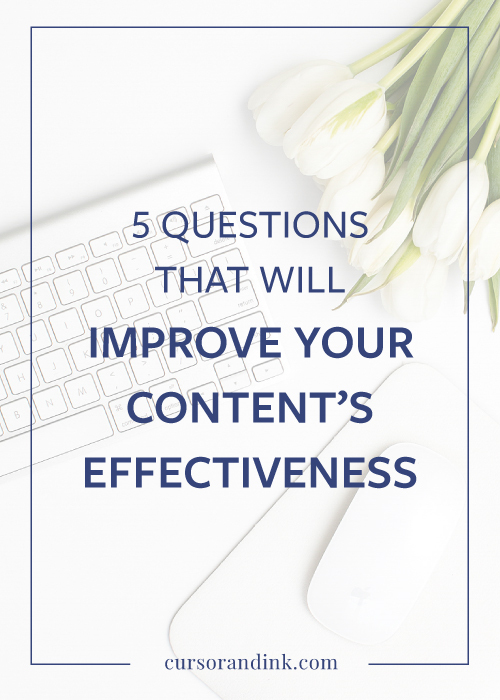 Question 5: Does the content support and enhance your overall brand? We already talked about your brand in the first question, so this is kind of bringing us full circle. Here, though, the point is to think about whether the way you’re communicating is consistent with the experience you want your readers and customers to have every time they come into contact with you. This is important because it builds trust, confidence and loyalty with your audience. People like consistency and reliability: they want to know what to expect from you! When you make sure that your content is delivering a consistent experience that they love, they will keep coming back for more. Is my tone consistent with my overall brand? Whether your overall tone is silly, sassy or serious, your goal here is to make your audience read (or hear, or watch) your content and know that it’s yours because it sounds like you. Are your values clearly expressed in this content? Two of my values for Cursor & Ink are encouragement and learning, both of which have a big impact on the way that I communicate. I always do a read through of my content once it’s drafted to be sure that the content expresses and aligns with both of those values. What are the things you want your brand to be known for? Do those values come through in the content you’ve created? Are my visuals consistent with my overall brand? When your audience associates a specific “look and feel” with you and your brand, it helps you to catch their eye (and their attention). It goes back to the point I made earlier about consistency. We’re constantly being bombarded with images, and when your content is accompanied by a specific look that they feel is specific to you, it helps you stand out to them as something they know, trust and want to pay attention to. I started out this post with a list of all the things you’re probably relying on your content to help you accomplish. That can be an intimidating and overwhelming thing — I totally get it! But I promise you, it doesn’t have to be. The trick is to take the time and think through what you’re trying to accomplish from a strategic objective. Do a little bit of planning beforehand, and as you begin to write and edit your content, keep that strategy in mind. These questions will help you do that. If you’re still feeling unsure or want some extra tips and strategies for how to create effective content in your creative business, check out my free email course, 5 Steps to Compelling Content. Over the course of five days, I’ll send you a daily email that will help you set the foundation for creating content that builds connection with your audience and grows your business. You can learn more here, or drop your info into the form below to get started right away! Success! All the details are on their way to your inbox now.